Adult coloring gets a makeover with charming, fashion-forward illustrations from this futuristic and glittering city. Wherever you’re off to, take Tokyo Street Style with you. Immerse yourself in this colorful city full of vibrant fashion and unique architecture. The stylish essentials laid out from your suitcase, elegant kimonos in store windows, and fashion-forward city dwellers complement the modern skylines. Embellish whimsical, full-page patterns with your own touch and enjoy Tokyo while you make your way through an iconic city. This sleek, high-end package has an elastic closure and a satin ribbon marker so you can dip in and dip out of your own Tokyo fashion week. With nothing more than some colored pencils, you’ll be on your way to a perfect day. I am all about finding creative ways to de-stress and unwind. So, I thought I'd give adult coloring books a try and let me just say - I am in love!! I'm serious, coloring books are now my jam. And my new favorite coloring book is Tokyo Street Style. I just loved flipping through the pages of this coloring book and getting a peek into Japanese fashion - talk about style with a capital S! Plus, we get to see some great images of the architecture in Tokyo - such stunning buildings. I really enjoyed filling in the pages with vibrant colors and shades of pinks, yellows, blues, reds, and greens. I loved imagining the city through these colorful images and couldn't help but think of little stories for each one. What a fun book! 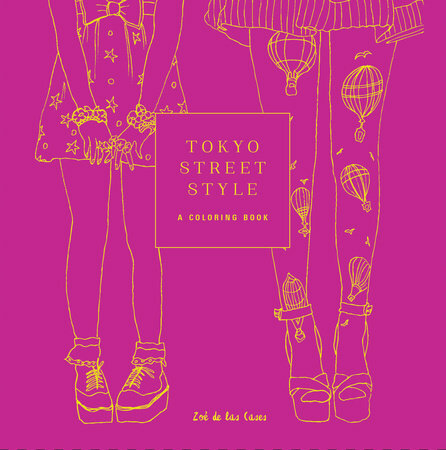 I would absolutely recommend Tokyo Street Style to fans of adult coloring books and anyone looking for a creative way to relax - you will LOVE this book!! Coloring...or doing any kind of art...is very relaxing, very zen...because you're very much in the moment. You know? I am passionate about coloring; just ordered myself a set of Irojetin pencils from Japan made by Tombow. I think they would be perfect for this wonderful book you reviewed! I like coloring too but have yet to finish a page in a coloring book. This one sounds like fun! This is a NICE coloring book, I am an avid ACB colorer,so I love seeing new books like this!! I love the look of this one! What a fun take! I've been into coloring for quite a while now. It's easy to pull a book out when the mood strikes, and not feel guilty if the mood leaves for a while. Just yesterday I whipped out a coloring book to relax after too much Sunday grading.